The San Jose Sharks, away from the confines of the Shark Tank, finished their long (and so far unbeaten) road trip with a visit to MSG to take on the winless Rangers (at home) in a Halloween matchup. Despite the horror shows that the Rangers had inflicted on their fans for the first 2 home games, this night the Rangers were more interested in doling out treats to their faithful. 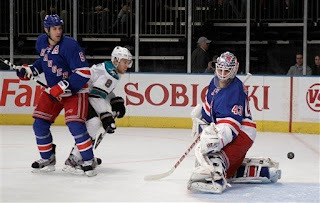 This time, there was no repeat of Saturday's debacle as the Blueshirts skated away with their first home win of the season, 5-2, behind the steady goalkeeping of Marty Biron. The official recap is here. Reports that the Rangers were looking to recall Sean Avery to the main club by putting him on re-entry waivers had been news all day. Rangers in time for Thursday's game v. Anaheim. 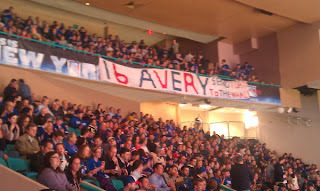 Speculation and wonderment have been raging among fans as to how Avery's potential return to the lineup would impact the team. One could surmise that certain players on the roster answered an important wake-up call as Artem Anisimov and Erik Christensen put up points and Captain Ryan Callahan had a 3 point night as the first line essentially got a night off from having to be the primary source of scoring. Ryan McDonagh had yet another goal (3rd of the season) to open the scoring in the first period and is showing signs of being a stud on the defense. He has been great as a defender and picks his spots to join the offense. the score 4-2 in the 2nd period. His offensive talent is so much smoother at this stage in his career than Marc Staal's ability (which started to bloom last season). Dan Girardi had 2 assists as the backliners continued to contribute to the scoring column. Best of all, for the second game in a row the Rangers scored more than 3 goals and again had a 3 goal lead in the 3rd period. So perhaps they are starting to get used to playing at their new home. Right from the start of the game, (at the 7 second mark), Brandon Prust tangled with Ryane Clowe that ended up with Prust hurting his hand a little, but he seemed to recover from it without too many problems. But the fight served to energize the Rangers as they moved the puck well, with only a few mistakes (Girardi in the neutral zone that almost opened a breakaway). 2nd goal during a power play. On a power play (which has been quite successful recently) Brandon Dubinsky and Derek Stepan teamed up to score thanks to a great cross crease one timer from Dubinsky from Niemi's right that he just didn’t see as Stepan swooped in from his left. 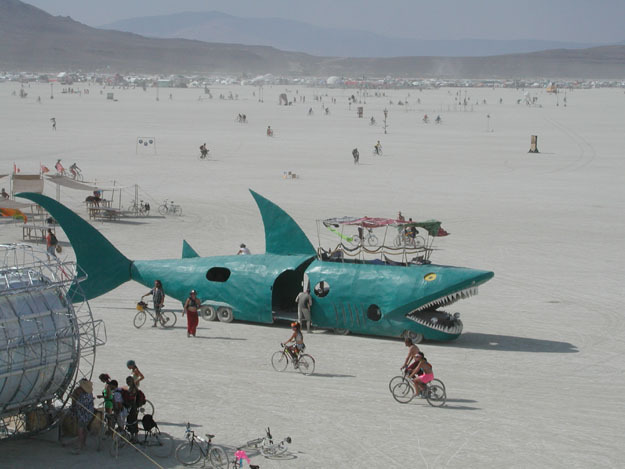 The Sharks quickly answered back with a shot by Pavelski that actually beat Biron twice. The first time the shot beat Biron to his right side cleanly, but hit both posts and and came careening out right to Pavelski who beat Biron to the right side. 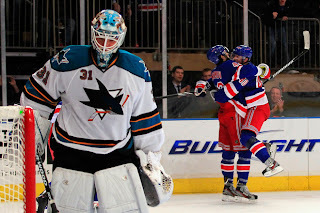 This time the puck stayed in the net and diminshed the buzz of the Stepan goal. The Rangers ran into a few problems into the second. At one point, the Sharks had the puck in our zone and without an opportunity to make a line change, fatigue wore in and another goal was scored by the Sharks to tie the game. Biron to make score 2-1 Rangers in the second period. 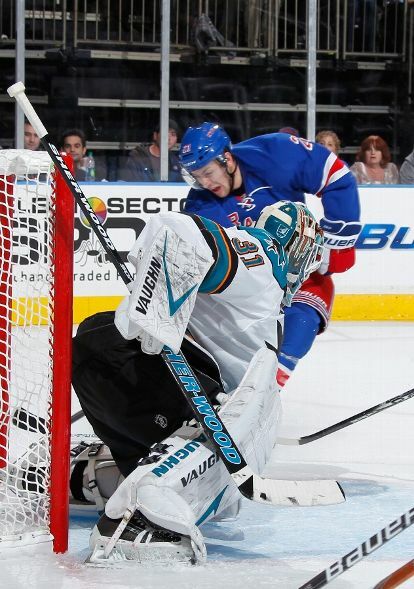 The Rangers just couldn’t get rid of the puck there and it cost them dearly. 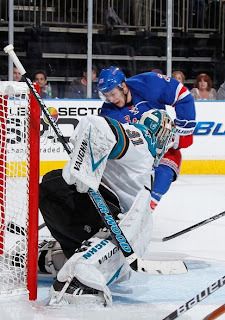 Right after that, the Rangers quickly regained momentum and took San Jose out of the game. After the game was tied, the Rangers went on to score 3 straight goals in the final 6 minutes of the period as they simply wore down the Sharks. That edge was seen in the Rangers 16 shots on goal during the period. It also led to witnessing two great goals. to make it 5-2 in the second period. First, Anisimov had a fantastic up and over shot close to the net off of a beautiful lead toward the net from Christensen. Second, it was Callahan’s second goal (and the last goal scored in the entire game) that was the topping to the period. It came with less than a minute to go in the period. Coming in hard into the offensive zone from the right side, he dished the puck behind him along the boards as he moved behind the net. By the time he actually cleared the net, Richards fed the Captain a pass that he was able to get in on a mostly empty net. This was done even as he was knocked down to the ice, and the look on his face was priceless. Cocky, even. There was no scoring in the third period, but the Rangers killed off 2 penalties in the 3rd to ensure that the Sharks would not have a 3rd period comeback like Ottawa did the other day. Andre Deveaux in his first game did okay as a center. He didn’t score, but he appears to be promising thanks to his gritty style. 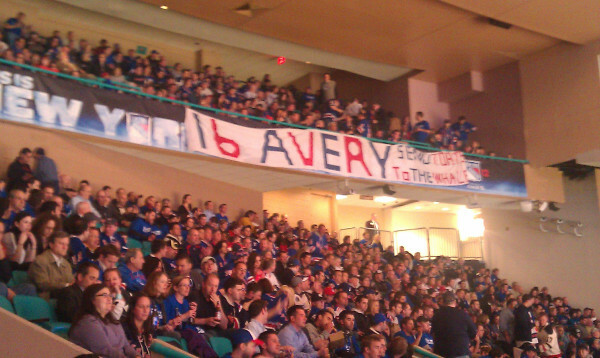 It will be interesting to see how he fits in and how long he stays once Avery is back on the roster. The Michael Rupp injury may prove to be a blessing for the Rangers by giving Avery and Deveaux a chance. We'll see how long that window is open. Overall, this game might prove to be the start of an upswing. The team is scoring, the power play has become more successful and against the Sharks, the Rangers only took 3 minors (in addition to Prust's fighting major). Also, the defense has settled down -- Michael Sauer is logging in nearly 20 minutes per game. Michael Del Zotto has beed adequate and not guilty of cover-your-eye mistakes. Granted, nothing ever changes overnight. There’s a scary notion whether Torts will change the lines up drastically with Avery in the equation, but right now, you can see the team's potential. After the Sharks' loss, Joe Thornton said that the Blueshirts "were probably the softest team we played on the [road] trip. We should have had these two points." It’s kind of odd that we’re getting this type of reputation, considering that the team leads the NHL in fighting majors. Coach John Tortorella did not take kindly to Thornton's comments, "He could go down as a player, being one of the better players in our league never to win anything. So what he should do is just shut up." Too bad these teams can only meet again this year in the Stanley Cup Finals. Overall, considering that the Rangers came away with the win, that has to say something about the progress we’re making. Tonight was easily Ryan Callahan’s night, with a little help from Marty Biron in net. Next game is Thursday night -- the 4th game of the 6 game homestand and likely includes Sean Avery's triumphant return to the MSG faithful in a contest against the Anaheim Ducks. The Garden should be rocking that night.